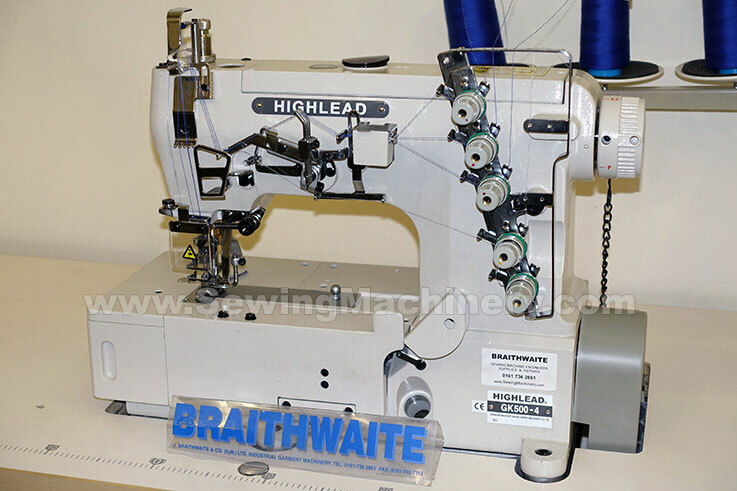 The Highlead GK500-4D is a high speed cover seam interlock industrial sewing machine with automatic thread trimmer. The GK500-4D automatic version includes automatic under thread trimmer, automatic top cover thread trimmer (option to remove) and electronic needle position servo motor with electric auto foot lifting device option. This general purpose flat bed model is suitable for sewing operations such as hemming, covering or decorative stitching on light to medium weight fabrics. The fully sealed bottom sump is equipped with automatic oil lubrication and interchangeable oil filter system; which enables the machine to run smoothly with low noise and vibration. Highlead Model GK500-4 = basic (non trim) version supplied on unit stand with basic clutch motor. Highlead Model GK500-4-B = Binding operations (pre-fitted with dedicated binding sewing equipment). Also available GK600-4 Cylinder Arm Cover-seam / Seam-cover, 3 needle top & bottom cover sewing machine.